Housebreaking the easy way. The super absorbent Wee-Wee Pad will attract puppies when nature calls. Plastic lining prevents damage to floors and carpets. Disposable. 30 pack Housebreaking super absorbent wee wee pads to attract puppies when nature calls- 23 x 24 in. The super absorbent Wee-Wee Pad is scientifically treated to attract puppies when nature calls - they know right where to go. Plastic lining prevents damage to floors and carpets. The Wee-Wee Pad can be used to gradually train your pet to go outdoors. The X-Large pad measures 28 x 35.5 for larger breeds or multiple dogs, and are available in four package sizes. 14 pack Extra Large Housebreaking super absorbent wee wee pad to attract puppies when nature calls- 30 x 36 in. NaturVet's Bitter YUCK! 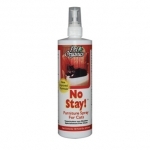 No Chew Spray is alcohol free, clear, non-sticky easy to apply spray that will stop animals from chewing and gnawing on any number of problem areas. Pet Organics No Go! has been developed to help you housebreak your pet. NO-GO! is not a repellent. When sprayed on the soiled area, NO-GO! will eliminate the urine scent so your pet will not re-urinate in that area. Pet Organics No Scratch for Cats helps train cats not to scratch furniture, carpets and drapes. Spray No Scratch on areas you wish to protect. A unique product that sprays on fabric surfaces and discourages cats innate desire to claw. Pet Organics No Scratch for Cats is made in the USA and has received the National Animal Supplement Council NASC Seal of Quality. 100% Money Back Guarantee! Pet Organics No Stay! 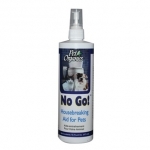 Furniture Spray for Cats is a special blend of natural herbs that most pets find dipleasing and prefer to avoid. Pet Organics No Stay! Furniture Spray for Dogs is a special blend of natural herbs that most pets find dipleasing and prefer to avoid.